Whether you need emergency carpet cleaning services or a regular maintenance of your carpets and tile, All Pro Restoration has developed a unique partnership with ZEROREZ of Denver to make sure that we are fully equipped for your carpet cleaning needs. Our cleaning trucks are equipped with spot treatments, upholstery cleaning tools, stair cleaning tools, tile and grout cleaning tools and much more. Freshly cleaned carpets after drying and re-stretching the carpets. As part of a Stay Beautiful Program, we recommend a 6-12 month carpet cleaning schedule in order to keep your carpets looking their best. Typically a 6 month carpet cleaning schedule would be recommended if you have children, pets or tenants. 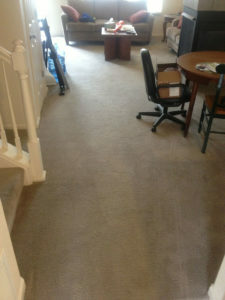 A 12 month carpet cleaning schedule would be for a home with light foot traffic. Along with having your carpets cleaned, we recommend your tile and grout be steam cleaned regularly as well. We can clean tile floors, walls and countertops, quickly and efficiently. We recommend cleaning your tile and grout every 12-24 months. Do not think that we have forgotten the emergency carpet cleaning that may be needed on occasion. Sometimes life happens and you are in desperate need of a carpet or tile cleaning, yesterday! This can be because of stains, spills, water staining from a leak or various other reasons. Our ZEROREZ carpet cleaning professionals are available 6 days a week for your carpet cleaning & tile cleaning convenience. Call us today for your carpet cleaning needs. Our friendly office staff will take your information and make sure a ZEROREZ customer service representative reaches out to you to schedule your cleaning as soon as possible. If you have a basement concrete area that you would like steam cleaned, All Pro Restoration also offer concrete steam cleaning services. Before you remodel your basement, make sure to have it steam cleaned by our professionals to ensure that you are not trapping unwanted dirt & deposits underneath your brand new floors! Please note that sewer backups or sewer drain lines that have caused water damage to your carpets, cannot be properly cleaned or sanitized. Our IICRC certifications do not allow us to clean sewage contaminated carpets. However, our technicians will gladly discuss your options with you when they arrive onsite.